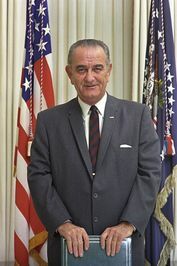 Lyndon Baines Johnson (August 27, 1908 – January 22, 1973), often referred to as LBJ, was the thirty-sixth President of the United States (1963–1969). Johnson served a long career in the U.S. Congress, and in 1960 was selected by then-Presidential candidate John F. Kennedy to be his running-mate. Johnson became the thirty-seventh Vice President, and in 1963, he succeeded to the presidency following Kennedy's assassination. He was a major leader of the Democratic Party and as President was responsible for designing the Great Society, comprising liberal legislation including civil rights laws, Medicare (health care for the elderly), Medicaid (health care for the poor), aid to education, and a "War on Poverty." Simultaneously, he escalated the Lyndon Baines Johnson (August 27, 1908 – January 22, 1973), often referred to as LBJ, was the thirty-sixth President of the United States (1963–1969). Johnson served a long career in the U.S. Congress, and in 1960 was selected by then-Presidential candidate John F. Kennedy to be his running-mate. Johnson became the thirty-seventh Vice President, and in 1963, he succeeded to the presidency following Kennedy's assassination. He was a major leader of the Democratic Party and as President was responsible for designing the Great Society, comprising liberal legislation including civil rights laws, Medicare (health care for the elderly), Medicaid (health care for the poor), aid to education, and a "War on Poverty." Simultaneously, he escalated the American involvement in the Vietnam War, from 16,000 American soldiers in 1963 to 550,000 in early 1968. The Vantage Point: Perspectives of the Presidency 1963-1969. And We Shall Overcome: " President Lyndon B. Johnson's Address to Congress in Support of the 1965 Voting Rights Act "
“Ask him about the cemeteries, Dean!" "Ask him about the cemeteries Dean!" That made it into a Presidential Order so he had to ask President DeGaulle. So at end of the meeting Dean did ask DeGaulle if his order to remove all U.S. troops from French soil also included the 60,000+ soldiers buried in France from World War I and World War II.